Welcome, one and all, to a new weekly feature on the blog. I wanted to take a look back through my archives, and pick out individual wedding photographs that perhaps show something about the way in which my documentary wedding photography works on the day itself. A chance to show off images that you might have seen before or ones which might be new to you, but give myself an opportunity to talk a little bit more about how they came to be and why I think they work so well. To start things off I’ve selected this documentary image from a wedding at Cripps Barn in the Cotswolds. Cripps Barn is a great venue in a lovely part of the world. I might be a bit biased, having just finished walking 103 miles through the heart of the Cotswolds (not all in one go, before you all start to think I’m some sort of super human), but it really is a beautiful part of the country. 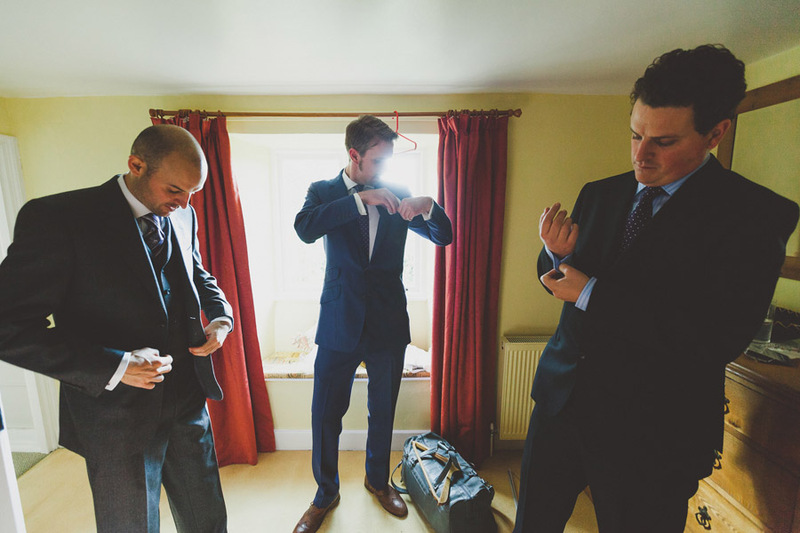 This image was taken while the groom (on the left) and his best man and usher were getting ready. It’s one of those pictures that as a documentary photographer you can almost see before it happens. In any situation you are assessing how people are standing, what positions they’re in and what interesting patterns might be formed by them. These three guys were all ignoring me and getting on with their final preparations. It wasn’t a big room, and that’s why they are stood in that position. I’d taken the other side of the room, against the light, and was waiting for the right moment. I like the way in which they are each doing something subtly different, each performing a different step in the preparation – adjusting a jacket, checking a pocket tissue or fastening a cuff link. The action of their hands moves your eye through the image and the packed bag at the feet hints at the fact they are nearly ready. I hope you agree that it makes for an interesting image! Fantastic. The perspective really puts you in the room with them.